Originally posted at InterACT (2014). As we enjoy the Labor Day holiday this year, it’s important to keep in mind the role of the labor movement in securing workers rights and better working conditions for nearly all Americans. The struggles of labor unions in recent decades have accompanied a continually widening gap between rich and poor, with frightening implications for our shrinking middle class and the working poor. My social media streams are full of reminders about the importance of unions, in the past, present and future. And I agree completely. But it’s not enough to just say we support workers. Those of us in teachers unions need to step up our actions to match our words. labor issues – negotiating for compensation, benefits, working conditions, etc. professional issues – advocating for better student learning by supporting teacher leadership in areas of curriculum, pedagogy, and professional development. social justice – taking an active interest in the well being of everyone in our community, especially those who are currently underserved, struggling, and less empowered. But I think we can do more in every area, and invite teachers to make a new school year resolution relating to labor and unions. I’m not claiming to be the role model for everyone to follow; I’ve done some of the following, and will try to do more of the suggestions below. Support labor and unions in general by making informed choices about your own consumption. Pay attention to labor issues in the news, and to buying guides from our own unions. If you’re planning any kind of event at a hotel or restaurant, try to find out if it’s a unionized business. If you need work done by someone in a trade, try to find union workers. Yes, it’s possible you will pay a little bit more. Remember that the difference is going to a worker or family in your community, and it may be the difference between a living wage and a poverty wage. Encourage your local association to be more involved in teaching and professional development issues. Talk to teachers in other districts to get ideas of what unions are doing in this area. Ask your local association to pay for teacher professional development activities that districts can’t or won’t cover. If we argue that the district alone bears the responsibility for quality teaching, then we have less reason to expect administrators to engage with unions on this issues. The California Teachers Association has an Institute for Professional Development, and they put on conferences that you should look into, and then ask your local to send a team of teachers. Look beyond teaching and learning and contracts, and see about getting your local engaged with the community. Sponsor or otherwise support events, activities, and other organizations that strengthen our communities. Organize drives, give-aways, fundraising, etc. Labor Day has to be more than a one-day nod to our past. The day off is a treat, beaches and barbecues are pleasant enough, and there is good reason to recall past success. 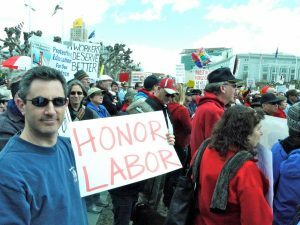 But without present and future action to strengthen labor and unions – and the values they stand for – we risk letting Labor Day turn into a sad, ironic, vestigial observance of an outdated concept. Instead, let’s take stock of the situation for workers in our community and country, make individual choices that are part of the solution, and organize for change.